Frostbite. 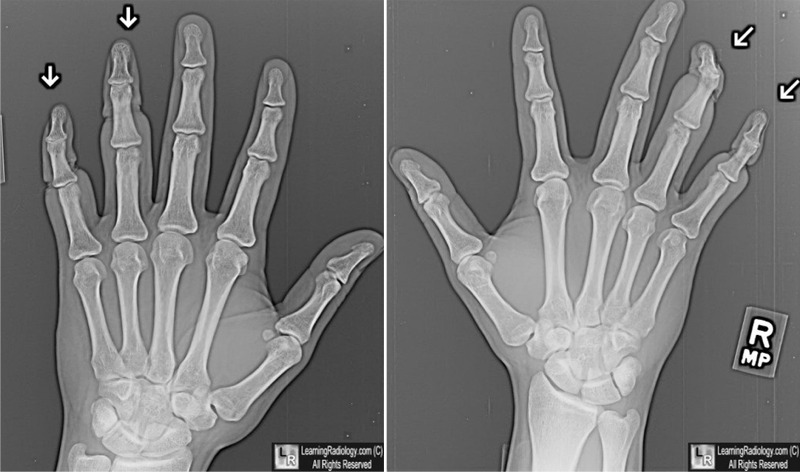 Soft-tissue technique for both hands shows chronic changes of soft tissue loss of the terminal phalanges of both ring and little fingers (white arrows). The patient had sustained frostbite injuries to these fingers 4 weeks earlier. Frostbite. CC Mechem, D Cheng, R Yakobi, TM Thompson. eMedicine. The Soft-Tissue and Bone Changes in Frostbite Injuries. Jack M. Tishler. Radiology, March 1972, Vol. 102, Issue 3.